Before :- B.M. Gupta, J. For the Petitioner :- Shri Arun Pateria, Advocate. For the Respondent/State :- Shri Mohd. Irshad, Panel Lawyer. Bhola Bhagat v. State of Bihar, 1998(1) RCR(Criminal) 21 : 1998 Cr.L.J. 390. Gopinath Ghosh v. State of W.B., 1984(1) RCR(Criminal) 444 : AIR 1984 SC 237. Rajendrasingh @ Sonu s/o Gopal Singh v. State of M.P., 2002(3) M.P.L.J. 315. 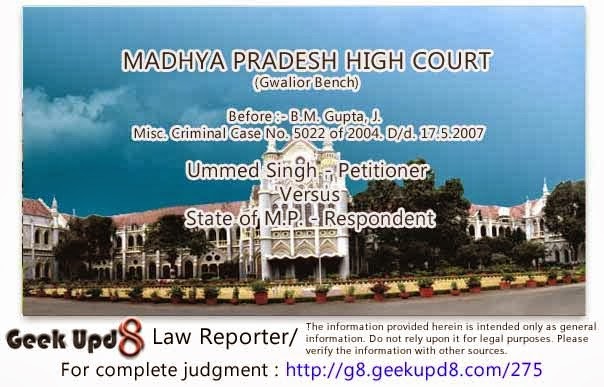 Sandeep @ Pappi v. State of Madhya Pradesh, 1994(2) C.Cr.J 128 (MP). Bablu v. State, 2006(4) MPHT 302. Jaya Mala v. Home Secy., Government of J & K, 1982 Cri.L.J. 1777. Akeel S/o Rehman Khan v. State of M.P., 1998 Cr.L.R. (M.P.) 82. Rajinder Chandra v. State of Chhattisgarh, 2002(1) RCR(Criminal) 586 : AIR 2002 SC 748. B.M. Gupta, J. - The instant petition is for impugning the order dated 17th February, 2003 passed by 4th Additional Sessions Judge (Fast Track Court), Shivpuri in criminal revision No. 6/03, whereby the learned Judge has affirmed the order dated 19th December, 2002 passed by JMFC, Kolaras in criminal case No. 1184/02, by which the learned Magistrate has disposed of an application dated 16th December, 2002 filed on behalf of the petitioner with regard to ascertainment of his age. 2. On perusal of the order dated 19.12.2002 of the learned Magistrate, it appears that initially a direction was given by him to Superintendent of sub- jail, Kolaras to get the examination done about the age of the petitioner. In compliance, the jailer sent ossification test report in which the age of the petitioner was shown as 21 years and age of the co-accused Sandeep was shown between 17 to 19 years. While accepting this report, it is observed by the learned Magistrate that the petitioner is not below 18 years. This order has been affirmed by the learned Judge vide impugned order. It is also observed in the impugned order that no academic record has been filed with regard to the age of the petitioner, hence, there is no error in accepting the age mentioned in the ossification test report. 3. While drawing attention at the observation of the Apex Court in Bhola Bhagat v. State of Bihar, 1998(1) RCR(Criminal) 21 : 1998 Cr.L.J. 390, Shri Pateria has submitted that it is obligatory for the Court to hold an enquiry for determining the age and no such enquiry has been conducted. The work of conducting enquiry cannot be assigned to a jailer by a Magistrate. 4. Shri Bhardwaj has submitted that enquiry has already been conducted as mentioned in the orders of the court below. 5. On perusal of aforementioned both the orders of Court below, it does not appear that enquiry as such was conducted. On the request of the petitioner, jailer was directed who sent the ossification test report and on that basis it is concluded that the petitioner is not below 18 years. On perusal of the impugned order, it also appears that no academic record with regard to the age has been filed. 6. On perusal of both the orders of the Court below, it does not appear that enquiry was conducted by the learned Magistrate. When an application was filed on behalf of the petitioner mentioning himself to be below 18 years of age at the time of incident, it was obligatory on the learned Magistrate to hold an enquiry under Section 7 of the Juvenile Justice (Care and Protection of Children) Act, 2000 (hereinafter referred to as the Act). As observed by the Apex Court in Gopinath Ghosh v. State of W.B., 1984(1) RCR (Criminal) 444 : AIR 1984 SC 237 in the case of Bhola Bhagat (supra) and by this Court in Rajendrasingh @ Sonu s/o Gopal Singh v. State of M.P., 2002(3) M.P.L.J. 315, although these judgments are related to the former enactments but on the same point. 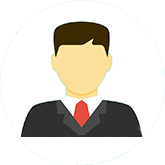 The provisions being similar this observation of the Court is equally applicable to the provisions of this Act. In absence of such enquiry, the observation of the learned Judge in impugned order dt. 17.2.03 that no academic record has been produced on behalf of the petitioner, is of no importance. Unless an opportunity is provided to the party while holding an enquiry to produce the evidence in support of its claim such observation does not call for. Vide copy of mark sheet of primary school education 1995 his date of birth appears 20.12.86. It is correct or not can be decided after holding an enquiry. If it could not be filed in the trial Court the petitioner cannot be blamed because no such opportunity was given to him. Although it all depends on the facts and circumstances of the case, but at the same time it cannot be denied that sometimes the age mentioned in the school record and stated in the statements of the parents are deserved to be accepted. For this, judgment delivered by the Apex Court in Vishnu v. State of Maharashtra, 2006(1) RCR(Criminal) 201 : 2006(1) Apex Criminal 41 : (2006)1 SCC 283 and order passed by this Court in Sandeep @ Pappi v. State of Madhya Pradesh, 1994(2) C.Cr.J 128 (MP) are to be perused. A juvenile cannot be tried alongwith the other co-accused persons as observed in Bablu v. State, 2006(4) MPHT 302. 7. Both the courts below have simply relied on the ossification test without considering fact that there is a presumption of having 2-3 years margin in either side as observed by the Apex Court in Jaya Mala v. Home Secy., Government of J & K and others, 1982 Cri.L.J. 1777 and also by this Court in Akeel S/o Rehman Khan v. State of M.P., 1998 Cr.L.R. (M.P.) 82, after conducting the enquiry if two views are possible for the purpose of determination of the age then the view favourable to the accused ought to be accepted. In such cases, hyper technical approach should always be avoided as observed by the Apex Court in Rajinder Chandra v. State of Chhattisgarh and another, 2002(1) RCR(Criminal) 586 : AIR 2002 SC 748. 8. In view of the aforementioned discussion the impugned order is set aside. It is directed that the trial Court will hold an enquiry for the purpose of ascertaining the age of the petitioner after providing an opportunity to both the parties to adduce their evidence and thereafter will pass order afresh in the light of the observation of the Apex Court and this Court as quoted herein above. Thereafter if he comes to the conclusion the petitioner is a juvenile in conflict with law as defined in Section 2(L) of the Act, then in that case he will take further steps in accordance with the provisions of the Act.